Around 80 ladies helped to raise almost £650 for charity whilst enjoying fashion, fundraising and fizz in Goring. Caring Lady Funeral Directors in Goring By Sea held a charity fashion show at the end of February to raise money for St Barnabas House. It was the first fashion show to be held by the local Funeral Co-ordinators after they had been inspired by other similar events. Jackie Arnaud, Funeral Co-ordinator at Goring’s Caring Lady Funeral Directors, said: “We had no idea how many people would be interested in the event but we sold almost 40 tickets as soon as we put them on sale. “But it was even more surprising on the night when we had around 80 ladies join us plus all of our incredible fashion volunteers and organisers. amount for our local hospice which is incredible. The fashion show, organised by Funeral Co-ordinators Jackie Arnaud and Sandra Choi, was held at Goring Conservative Club. The venue was kindly offered for free along with a generous donation of a glass of prosecco for everyone who attended. A large number of local businesses also donated raffle prizes which was so popular that they ran out of tickets and had to rush out to buy more. Travelling Trends was the fashion organiser and kindly donated 10 percent of the sales on the night. St Barnabas House is an independent charitable hospice located in Worthing, West Sussex. It provides end of life care services, both at the hospice and in the local community, to adults with advanced progressive life-limiting conditions. 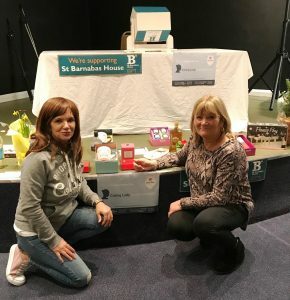 Mary Bye, Community Fundraiser at St Barnabas House, said: “Thank you so much to Caring Lady Funeral Directors for organising such a wonderful, fun event. Everyone here at St Barnabas is very grateful for their amazing support. With six branches in West Sussex, Caring Lady Funeral Directors are pleased to support local charities in their community. Local charities and causes is in need of support are invited to contact their local branch.